Chelsea Manning is again acting heroically in the name of press freedom, and it’s a travesty that she has been sent back to jail for refusing to testify to a grand jury. An investigation into WikiLeaks for publishing is a grave threat to all journalists’ rights, and Chelsea is doing us all a service for fighting it. She has already been tortured, spent years in jail, and has suffered more than enough. She should be released immediately. Chelsea Manning continues to defend freedom of speech and the press heroically. She should be freed immediately. 14925 3 days ago Raymond Nicholson Woodstock, GA , US I'm these troubling times were the Democrats and Hillary Clinton have committed such evil crimes locking Ms. Manning up for doing the right thing is beyond outrageous . Release Miss Manning now . 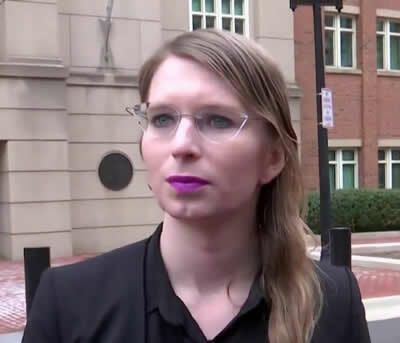 14924 4 days ago Amy Allard Woodstock, GA , US Chelsea Manning took an oath to protect the American people and that is exactly what she is doing. Release her immediately. 14923 4 days ago margie mcclure Portland, OR , US This is so Petty! and so Outrageous! Release Chelsea Immediately for daring to do what we have the Constitutional Right to so do! 14921 5 days ago Richard Stone Black Forest, AU What is all this really about? Class and state power, protecting an elite? 14919 6 days ago Anonymous Palmdale, CA , US Chelsea Manning should be free! Where do we all meet? 14918 6 days ago Leo Elizabeth Alonzo Los Angeles, CA , US Get Her Out ASAP....Enough of this BS!!! 14917 6 days ago Sally Nelson Goldfield, IA , US Freedom of speech is Democracy! 14911 7 days ago kay brown south pasadena, CA , US free now. 14910 7 days ago Scott Poynting Sydney, ot , AU Free Julian Assange too! He has been unlawfully deprived of liberty for almost seven years, for the same whistle-blowing as Chelsea Manning. 14907 1 week ago Lily Mohelská DE This woman should neither be forgotten about, nor should she be jailed for publishing such valuable information. What a society do people condemning her actions want to live in? By taking action you will be automatically signed up for action alerts from RootsAction. We consider your contact information to be private and confidential. We will NOT disclose it to any other entity unless you specifically authorize us to do so. You can unsubscribe at the bottom of any email you receive from us.